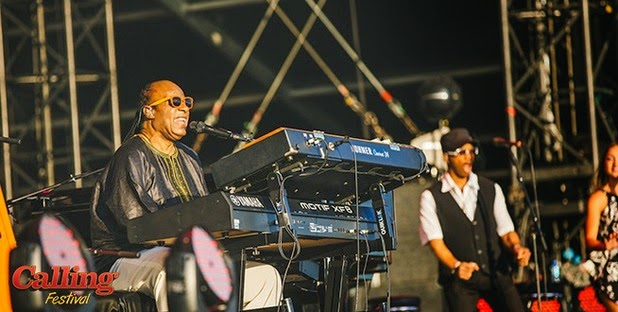 Sunday 29th June 2014: There's nothing better than a singalong on a Sunday evening with thousands of others who have flocked to see the legend that is Stevie Wonder - and that's exactly what we got! Kicking off a set full of hits, Stevie entered the stage playing his keytar and instantly went into a cover of How Sweet It Is (to be loved by you) - the start of many a song I would lose my voice to singing along! Hit after hit kept coming including Master Blaster, Part-Time Lover, Living For The City, and even an acapella version of Ebony and Ivory of which we got to sing most of ourselves... brilliant fun! Sir Duke, Signed, Sealed, Delivered, You Are The Sunshine Of My Life, My Cherie Amour were all played as the sunlight was fading down over South London, and speaking of London, Stevie joked with us that he was actually British and from Brixton! He had us all in stitches with his best cockney accent. After a rousing performance of I Just Called to Say I Love You, again I was losing my voice, Stevie gave a heartwarming nod to Bobby Womack who sadly passed away last week. Paying tribute with a great Womack cover of If You Think You're Lonely Now, Stevie and his backing singer sang with great emotion and style, a fitting tribute indeed. You can't not go to a Stevie Wonder gig and not hear Superstition - he saved the best 'til last, and what a fabulous way to end this years Calling Festival with a guest appearance from Richie Sambora too. A weekend of quite simply great music and performances, and we weren't deterred by the weather... If you couldn't get to Glastonbury this year, this was the next best thing.